Affected by the El Nino event in the Pacific Ocean, Typhoon No.11 evolved in the vicinity of the date line, a more easterly genesis than usual. Sea surface temperatures (hereinafter referred to as SST) remain cooler than normal in the ocean surrounding the Philippines, due to the weaker ridge of the Pacific anticyclone to the west. The typhoon headed north along the western margin of the Pacific anticyclone, and struck the central part of the main island of Japan directly and caused heavy damages for example through floods in several localities. Typhoon No.12 appears to follow a similar course. This El Nino is expected to be one of the strongest events in recent history and may exert significant impacts across the globe. Besides the Pacific Ocean, we have also been focusing on the Indian Ocean state. As our team predicted, Indian Ocean Dipole (IOD) seems to have occurred in the tropical Indian Ocean. IOD also brings about abnormal weather around the world including Japan. In this column, we would like to illustrate the current status of the IOD along with the future prospects. Taking a look at the anomaly (deviation from the average year value) in early July reveals warmer than normal SST in the western, and cooler than normal SST in the eastern tropical Indian Ocean (Figure 1). This is a typical pattern of a positive IOD. (*1 What is IOD?). The positive IOD causes strong convection in the tropical western Indian Ocean, which leads to increased precipitation and frequent floods in the tropical East Africa covering Kenya. 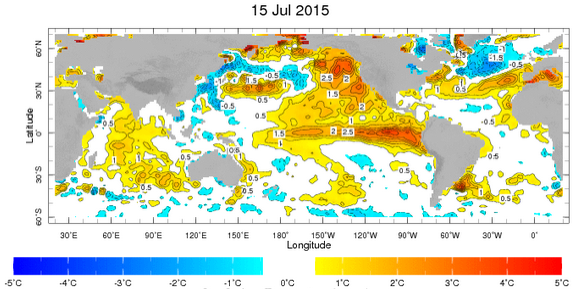 Average abnormal values of SST between 12th and 18th July 2015 (Courtesy: IRI Map Room). Warm and cold colors indicate higher and lower temperatures than the average year, respectively. IOD also produces strong downdraft and anticyclone in the tropical eastern Indian Ocean, resulting in droughts in Indonesia and northern Australia (*2 commentaries from Australian Bureau of Meteorology). In the absence of El Nino in the Pacific Ocean, winds from this anticyclone cause strong convection and cumulonimbus activity in the sea adjacent to the Philippines. In the vicinity of Japan located in the downdraft area, Ogasawara High on the western margin of Pacific anticyclone develops and brings extreme heat to Japan. Additionally, it is known that strong convective activity in the northern Bay of Bengal produces intense heat to the downdraft area i.e. the Mediterranean neighborhood, whose effect heads east along the Asian Jet, inducing fierce heat in western Japan caused by a tall anticyclone. 1994 was a typical year with such extreme heat when positive IOD impact was remarkably observed. Most recently, Japan experienced intense summer heat caused by IOD in 2012 (*3 announcement from Japan Meteorological Agency). Application Laboratory, JAMSTEC, developed a system (SINTEX-F seasonal forecast system, *4) in 2005 that allows us to numerically predict emergence of climate phenomena such as El Nino and IOD, and associated seasonal abnormalities around the globe using the super computer called the Earth Simulator. Since then we have been experimentally operating the system while further improving the sophistication of the models. The system allows the forecast of El Nino emergence more than a year in advance. It also predicts IOD occurrence 1 to 2 seasons ahead of time despite difficulties owing to climate complexity of the Indian Ocean. The system has an excellent reputation as one of the best prediction models in the world. In fact, as early as in Mach 2015, the model had predicted the positive IOD to occur in this summer through autumn, which was distributed via our laboratory’s website (Figure 2, *4). Abnormal values of SST calculated with the SINTEX-F system on 1st March 2015. Warm and cold colors indicate higher and lower temperatures than the average year respectively. The pattern depicts a typical positive IOD where SST rise in the western, and fall in the eastern tropical Indian Ocean compared to an average year. The system is already utilized in industries like agricultural businesses, although still under trial operation. We are pleased to have made a correct prediction. Our prospect is that the positive IOD will continue to develop, and reach its peak this October or November (Figure 3). The expected impact includes decreased harvest of wheat in Australia, droughts in Indochina and Indonesia and flooding in tropical East Africa during the rainy season from this October to November. While the El Nino development in the Pacific Ocean is prone to induce cooler summer in Japan, this year’s positive IOD that has just began to develop, later than usual, may produce lingering summer heat in Japan. We recommend paying attention to development of the positive IOD, not just El Nino in the Pacific Ocean; certainly not to take your eyes off the tropical ocean from now. Time-series of IOD index (based on SST difference between the western and eastern Indian Ocean. Unit: °C). Values above 0.5 °C denote typical positive IOD. The blue line represents the observed index, and red line represents the ensemble average of the SINTEX-F predictions initiated on 1st July 2015. Grey lines represent each ensemble prediction (ensemble prediction is an accumulated forecast method where predictions are carried out changing initial settings little by little). This graph suggests that the positive IOD will continue to develop and come to an end at the end of the year, following its peak in October-November. *4: SINTEX-F seasonal forecast system; a system to predict seasonal abnormalities (deviations from the average year) several months in advance using computer. The system comprises groups of formula (models) related to atmosphere-ocean-land physics. It calculates temporal development of observed situations by segmenting the earth into 3-dimentional grids, and numerically integrating the formula over time for each grid point. Based on SINTEX-F, an atmospheric-ocean circulation model co-developed by Japan and Europe, the system is operated using a super computer called the Earth Simulator that JAMSTEC owns. The system achieved the world’s most advanced prediction in El Nino and IOD (e.g. Luo et al. 2008. Geophys. Res. Lett. ; Jin et al. 2008 Climate Dynamics). Our laboratory delivers results at near-real time seasonal prediction on the following website on a monthly basis. The information contained herein is provided as a public service to introduce our research activity and seasonal prediction experiments conducted at Application Laboratory (APL)/JAMSTEC. We do not warrant or take any responsibility for the accuracy, completeness, reliability or suitability with respect to the website or the information, products, services, or related graphics contained on the website for any purpose. Any reliance you place on such information is therefore strictly at your own risk.